Today extreme performance memory specialists G.Skill wrote to HEXUS about a new world record breaking memory kit. This time around G.Skill has created a new 64GB (4x16GB) SO-DIMM Kit for those using SFF machines or laptops. 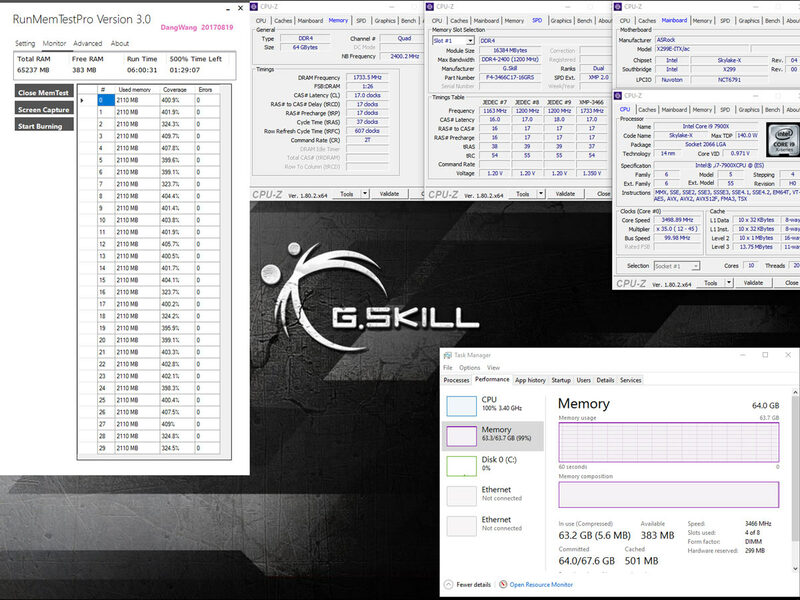 The headlining speed of the new G.Skill Ripjaws DDR4 SO-DIMM memory kit is 3466MHz CL17-17-17-37 at 1.35V. It was only a week ago that G.Skill launched the world's fastest 32GB DDR4 SO-DIMM kit (4x 8GB, 4000MHz, CL 18-18-18-38, at 1.35V), again under its Ripjaws sub-brand. Of course that offers quite a significant increase in headline speed rating but if 32GB would cramp your style and 64GB is what is required then this new Ripjaws SO-DIMM kit could be a good choice. If you have read about G.Skill's other world record breaking memory products recently you will know its modus operandi by now. The firm's tech staff "rigorously hand-selects Samsung B-die DDR4 IC components," and then tests the resulting memory modules and assembled kits to take "overclocking to new heights of system memory performance". Commenting on the new memory kit, G.Skill says that the high capacity, high frequency, low timings delivered by its latest Ripjaws SO-DIMM kit, using 16GB modules, will appeal to those designing high end machines and workstation PCs for SSF chassis. Above you can see G.Skill's testing results on a system sporting the new Intel XMP 2.0 compatible Ripjaws DDR4 SO-SIMM 3466MHz CL17-17-17-37 kit alongside an Intel Core i9-7900X processor and ASRock X299E-ITX/ac mini-ITX motherboard. This setup was run at full pelt for six hours. In another test, AIDA64 reported the new kit achieving 95231MB/s read, 94856MB/s write, and 90639MB/s copy. We don't have pricing for this memory kit yet, but G.Skill says it will become available from Q1 next year. Drop prices first then do this.